Every season the NFL gives us some surprise performances from players throughout the league. Some can be explained by a change in scheme or position that put a player in a better position to succeed, but some just come out of the blue and seem to defy all explanation. Minus a rocky first half against the Pittsburgh Steelers last week on Monday Night Football, Ryan Fitzpatrick has been outstanding to start the 2018 season. In his career, the journeyman quarterback has never produced an overall grade above 75.0 in a season, but through three games Fitzpatrick’s grade is elite-level at 93.8, first among quarterbacks. Fitzpatrick has performed particularly well when asked to throw 20 or more yards downfield, generating 357 yards on eight completions for five touchdowns to start the year, all good for a passer rating of 141.4, the best mark among quarterbacks through three games. With Jameis Winston’s return from suspension lurking, Fitzpatrick will continue to be under pressure to produce at a high level as the season rolls along. Rookies rarely emerge the way Phillip Lindsay has to start his first NFL season. Lindsay has logged 36 total touches in three weeks before his ejection early in the second quarter of Week 3 against the Ravens. On those attempts, the rookie has earned 233 yards, forced eight missed tackles, and is averaging 3.73 yards after contact on the ground. Despite his size (5’8”, 190), Lindsay has been outstanding on rushes between the tackles. The rookie is averaging 9.08 yards on carries up the middle to start the season forcing five missed tackles on 12 attempts. At the moment, the Los Angeles Rams arguably possess one of the best offensive lines in the entire NFL, and the rise of Austin Blythe is a big reason why. 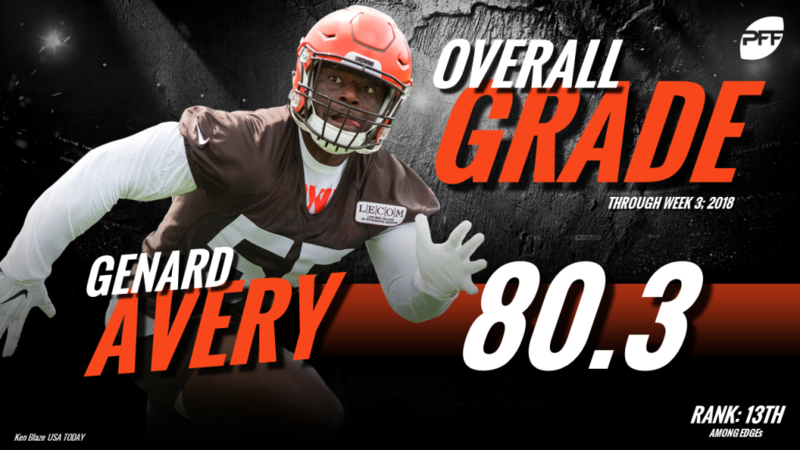 Ranking every offensive lineman across the league by grade, Blythe was second with an 83.2 overall grade going into Week 4. The third-year lineman has improved every season since entering the league, and his Week 3 pass blocking grade of 88.2 against the Chargers was his career-best thus far. Adding in Thursday night’s game against the Vikings, Blythe has allowed only five total pressures in 151 pass block snaps and is yet to allow a sack. Josey Jewell is another rookie making noise for the Broncos early this season. A fourth-round selection out of Iowa, Jewell has improved his overall PFF grade in each game to start the year. Jewell’s game against the Ravens in Week 3 was by far his best, and that performance earned an elite-level grade of 91.0 and a spot on PFF’s NFL Team of the Week. The rookie has been impressive against the run, but it’s his coverage skills that have jumped out as a surprise. Jewell’s coverage grade of 88.3 ranks third among linebackers going into Week 4. The rookie out of BYU has started each of his first three games in the NFL at middle linebacker for the 49ers and graded out as PFF’s eighth-ranked linebacker in Week 1 against the Vikings. With this performance, Warner earned a spot on Neil Hornsby’s list of NFL Secret Superstars for the week. It’s been his coverage skills that have been his forte early this season. Through three games, Warner has allowed only nine receptions on 18 targets while in coverage, and his 58.6 passer rating allowed ranks fourth among qualifying linebackers. Avery adds to the rookies that are joining the list of biggest surprises this season. The fifth-round selection out of Memphis is the only player to rank within the top-5 of PFF’s 2018 NFL Rookie Rankings every week thus far. Going into Week 4, Avery ranks 13th at his position in terms of overall grade at 80.3, and the rookie’s 16.7% run stop rate ranks fifth among all edge defenders who’ve seen at least 20 snaps in run defense. After playing safety, slot and boundary cornerback intermittently throughout his career, Byron Jones’ permanent move back to the boundary cornerback position has produced impressive results so far. 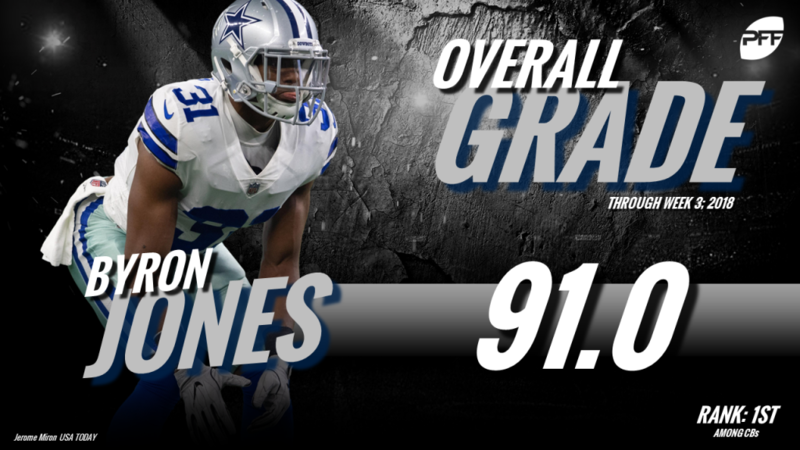 Since being drafted in 2015, Jones has not generated an overall season grade above 75.0 for the Cowboys, but through three weeks this season, the cornerback has been exceptional with an overall grade of 91.0 and a coverage grade of 91.1, both ranking first at the position. Jones was a PFF Sunday Standout on defense against Seattle in Week 3 as he allowed three receptions on seven targets for a mere 10 yards. He also added two pass breakups and only allowed a passer rating of 50.3 into his coverage. Melvin Gordon III and Austin Ekeler have formed one of the most formidable running back duos in the NFL through the first three weeks of the season. 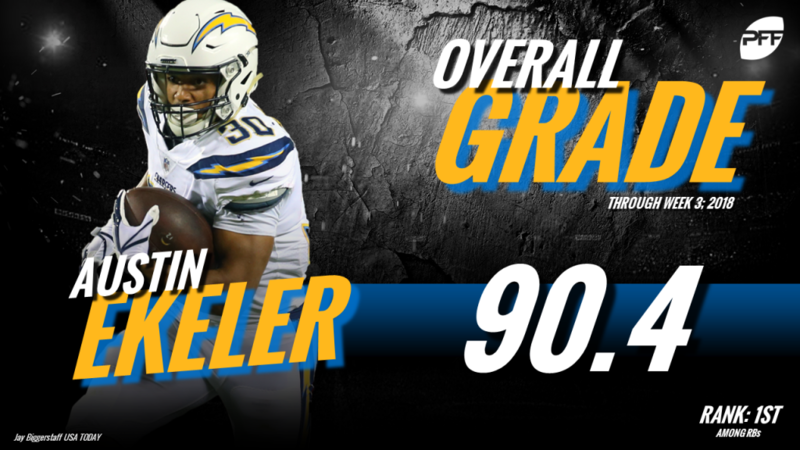 In 63 total snaps, Ekeler ranks first in overall grade and receiving grade among all running backs this season at 90.4 and 91.1, respectively. Through three games, Ekeler has posted 31 total touches and has forced 11 missed tackles and his 173.9 elusive rating ranks first, by far, at the position. Ekeler has also been a wildly productive receiver out of the backfield, averaging 3.57 yards per route run. The injury to Jimmy Garoppolo might hurt his statistical production, but George Kittle has emerged as a high-level target at tight end to begin the 2018 season. 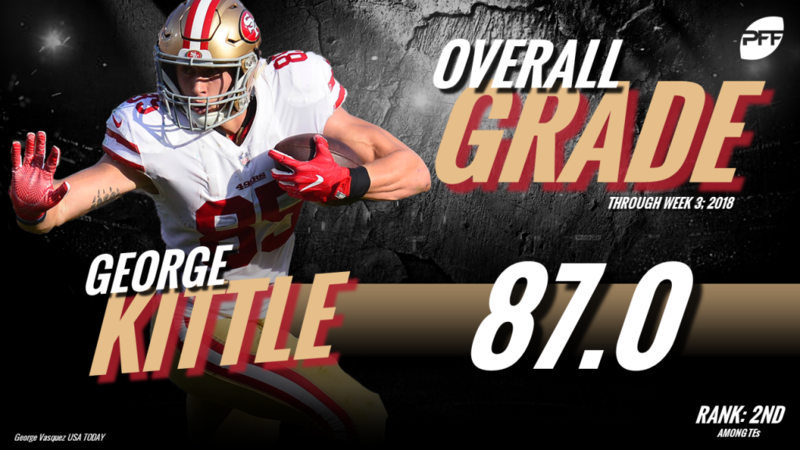 Kittle has been outstanding as a pass-catcher with a receiving grade of 90.2 this season, second-best at the position. His play against the Chiefs in Week 3 was the best among tight ends, and from his five receptions, he forced five missed tackles, showcasing his playmaking ability with the ball in his hands. The Seahawks boast two safeties currently graded in the top-5 at the position through three games this season. McDougald has been consistent in coverage during previous seasons, but it’s been this ability that has made the surprising jump to elite status to begin 2018. The safety has allowed eight receptions on 12 targets for 48 yards with two interceptions, and his coverage grade of 90.1 ranks second only to Earl Thomas through three weeks. Up until 2017, Wilson’s career-high overall grade sat at a lowly 68.4, but he significantly improved production last year and prompted Miami to get out their checkbook for a three-year deal. This year, he’s taken yet another step forward. He currently ranks second in the NFL in yards per route run with a remarkable 3.84, his 90.1 receiving grade ranks third overall, and his 154.4 passer rating when targeted ranks sixth. 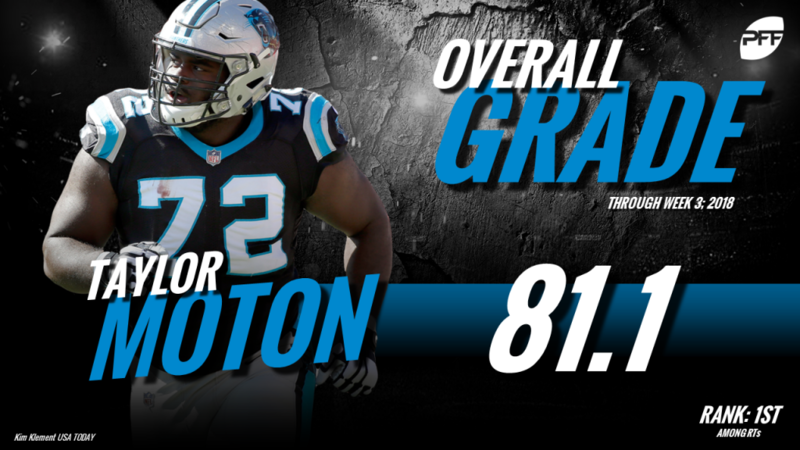 Moton has stepped up in a major way along the injury-ravished Panthers offensive line this season. Through three games, Moton is the highest graded right tackle in the NFL at 81.1, and on 63 pass block snaps (36 at left tackle in Week 1) Moton has allowed only two quarterback pressures. He has also been a mauler in the run game with the highest run blocking grade among all offensive tackles at 81.1. Guy is another player that’s been around for a while (since 2012) without making much of an impact. He’s never played fewer than 208 snaps per season and in that time he’s never produced a grade above 75.0 in any year. However, through Week 3, Guy has emerged as a run stopping machine while occasionally pressuring the quarterback. The veteran interior defender has generated nine stops against the run, tied for second at the position, and his run stop percentage of 15.5% is sixth-best. Guy stood out in Week 2, earning a spot on the PFF NFL Secret Superstars list for the week for his play against the Jaguars. Prior to the 2018 season, Wynn’s previous career-high overall grade was the unimpressive 66.7 he earned in his rookie year, so to say that his 87.8 overall grade through three weeks is a surprise, would be an understatement. Wynn has stood out defending the run so far, as his 20.0% run stop percentage ranks tied-for-first with the Eagles’ Brandon Graham. Wynn has also generated seven quarterback pressures in 63 pass rush snaps. The Giants are looking forward to the return of edge rusher Olivier Vernon in the coming weeks, but have to be thrilled with Wynn’s production to start the year.